The Concho River Review publishes writers from all over the United States and, occasionally, writers from abroad. We enjoy publishing writers for the first time. We have a fiction editor, poetry editor, nonfiction editor, and a book review editor who choose works for publication. 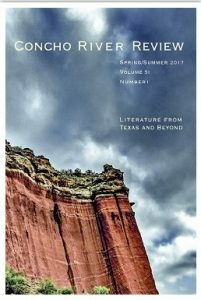 Begun by novelist and short-story writer Dr. Terry Dalrymple in 1987, Concho River Review is a biannual literary journal published by the Department of English and Modern Languages at Angelo State University. Since its inception, CRR has prided itself on publishing some of the finest short fiction, nonfiction, and poetry from both emerging and established authors. Although originally designed as a forum for Texas writers, over the years its reach and interests have extended well beyond Texas and the Southwest. While CRR is published biannually, we welcome submissions of high-quality fiction, nonfiction, poetry, and book reviews year-round. CRR accepts only original work that has not been published previously. The Concho Reviews takes submissions of Fiction, nonfiction, poetry, and book reviews. All sessions will take place in the University Auditorium, Mayer Administration Building, on the Angelo State University campus.